Place a ¼ – ½ teaspoon of the sugar into the palm of your hand. Make a fist to squeeze the sugar together until it starts to stick to itself. Work the sugar into a ball and put it on a small plate. Repeat until you have 10 balls and place them in the freezer while you make the dough. Reserve any remaining sugar for another recipe. Put a small pot of water on your stove top and bring it to the boil. Sift the flour into a large bowl. Put the essence and a few drops of the food colouring into the water and whisk them till they are well combined. Slowly add half of the water to the flour. Stir the mixture with a wooden spoon and add a little more water. As the dough becomes wet, use your hands to bring it together. Only add enough water until you get soft, smooth dough like consistency. If the dough is too dry add more water. If it is too wet, add a little flour. Place the dough onto your bench and knead it for a minute until it feels right. Divide the dough into 10 equal portions. Roll into balls. Using your thumb, press a large indentation into each dough ball. Place the sugar in the indentation, fold the sides of the dough around the sugar and roll it in your palms again to form a layered ball. Repeat this until you have made 10 balls. Place the balls into the boiling water. 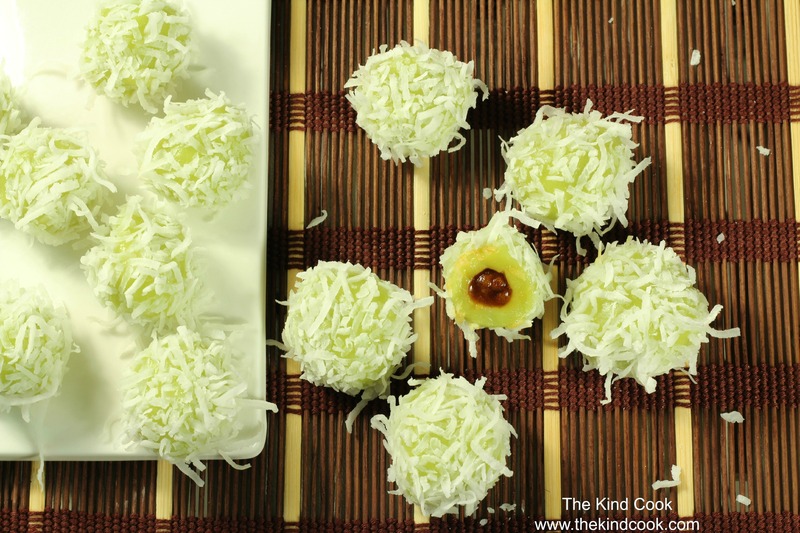 When they float to the surface, gently remove them with a slotted spoon and roll them through the coconut. Time: 10 minutes preparation. 3-5 minutes cooking time. Notes: You can purchase palm sugar and glutinous rice flour at Asian grocers. I use a brand of food colouring called Hopper made using fruits and vegetables. It can be purchased from select health food stores.